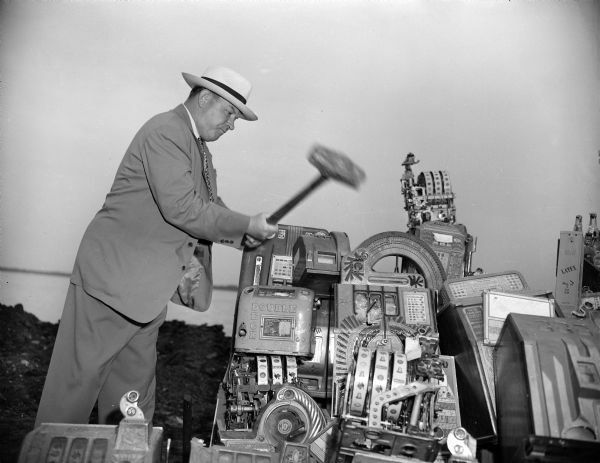 John Roach, director of the state beverage and cigarette tax division uses a sledge hammer to smash illegal slot machines. Similar photograph published in the Wisconsin State Journal, June 18, 1948. John Newhouse was a photographer for the Wisconsin State Journal in Madison, Wisconsin. The Society maintains his papers (1945-1974) which includes photographs and negatives of Madison locations, clippings of articles by Newhouse on local issues, especially Frank Lloyd Wright's Monona Terrace Project, the Monona Basin Project, city planning, and the Madison Public Housing Authority.